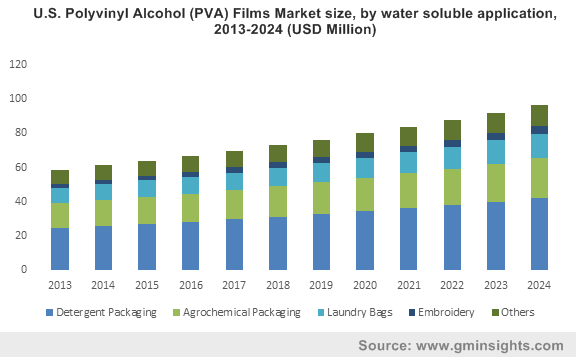 Water Soluble Polyvinyl Alcohol (PVA) Films Market size was valued nearly USD 241 million in 2015 and is anticipated to reach the mark of USD 376 million by 2024. Whereas polarizing application of PVA films market was valued at USD 5 billion in 2015. The growing concerns about health hazards from waste disposal of products packaging have given rise to the need of biodegradable packaging solutions. This has ultimately given a boost to the polyvinyl alcohol films market in recent years. Moreover, the stringent government regulations restricting the use of certain packaging materials has switched many packaging companies towards polyvinyl alcohol films. Consumer awareness regarding cleaning and maintaining a hygienic atmosphere in their surrounding has led to the increase in the usage of detergents. Agrochemicals such as fertilizers, pesticides, insecticides and other related chemicals has witnessed an upsurge in their consumption due to the demand of high yield in agricultural sector. The growth in hospitality industry such as hotels, resorts, amphitheatres, entertainment industry has contributed further in the detergents market by their daily usage. Rapid industrialization along with the need of a healthy environment of working has increased the demand of detergents simultaneously. Moreover, detergents and agrochemical packaging sector has maximum share in terms of volume in the polyvinyl alcohol films market. Thus, robust growth of these sectors provides a positive outlook of polyvinyl alcohol films market size. The rise in global population, increase in disposable income and purchase power parity of people has resulted in improved standard of living of people. This in turn has prorogued people to adopt the services of laundry in their daily routine. The bags used in laundries are made up of polyvinyl alcohol films as it is easy to dispose these bags. So, the flourishing laundry services is anticipated to offer a promising growth for polyvinyl alcohol films market. The demand of polyvinyl alcohol films is increasing in the field of embroidery for protection and aesthetic appearance. Embroidery has become a traditional art that can be seen on decorative items, paintings, sarees etc. Also, many antiques are preserved using polyvinyl films, these all applications are contributing significantly in the global polyvinyl alcohol films market. E-waste is another rising concern, which has led to many health hazards. These health hazard issues have increased the demand for usage of biodegradable polarized polyvinyl alcohol films in electronics products. The flourishing market for electronic gadgets and devices like laptops, LCD panels, sunglasses, optical filters, has boosted the polarized polyvinyl alcohol films market. In water soluble applications of polyvinyl alcohol films, detergent packaging application segment is anticipated to expand at highest CAGR of 4.4%. Detergent packaging is again segmented into consumer and industrial detergents of which consumer segment accounts for nearly 59% of the market share in terms of volume. The rising awareness and concern of people for their health and hygiene has resulted in growth of detergent market. The biodegradable, water soluble, and low-toxic nature of polyvinyl alcohol films has increased its adoption for detergent packaging. Another major application contributing in the polyvinyl alcohol films market is of agrochemical packaging. This agrochemical packaging segment was estimated to be 5,546 tons in 2015 and is anticipated to expand at a CAGR of 4.2% reaching up to 8,033 tons till 2024. Polarizing is another application segment of polyvinyl alcohol films that accounts for nearly 94% of the market share in terms of value. These polarized films are majorly used in LCD panels, the market size of films used in LCD panels in the year 2015 was 246 million square metres and is forecasted to expand at a growth rate of 4.8% in the forecast year. North America is anticipated to have the maximum share in the consumption of water soluble polyvinyl alcohol films market. The highly-regulated market for packaging of North America, especially in the countries like U.S is the driving factor for PVA (polyvinyl alcohol) films market in this region. Asia Pacific is the next upcoming region in this market owing to the wide application of PVA films in the field of agrochemical, laundry and embroidery. Asia Pacific is expected to have a market size of 4,000 tons in 2015 and is forecasted to grow up to 6,268 tons in 2024 with a CAGR of 5.0%. The raw materials required to produce water soluble PVA films are polyvinyl alcohol resins and vinyl acetate monomer (VAM). As VAM is manufactured by ethylene so its prices are fluctuating as per the pricing trend of crude oil. VAM manufacturers have developed extensively owing to the low-cost technology involved in its manufacturing and better production efficiencies. The major VAM manufacturers include Eastman Chemical, Celanese, BP Chemicals, the presence of these key players in the market ensures a continuous supply of raw materials in the manufacturing of PVA films.